Mary has a private studio for professional singers, and runs occasional consultation sessions for singers hoping to pursue professional training. She regularly works as resident vocal coach for a number of West End shows, including Jesus Christ Superstar, Shrek the Musical, Funny Girl, Groundhog Day, wonder.land (National Theatre), Into the Woods (Opera North/West Yorkshire Playhouse), Wicked, Women on the Verge of A Nervous Breakdown – the Musical, Chicago, Guys & Dolls, Ghost - the Musical, and Once. Mary has been associated with a number of different training organisations - she teaches at the Royal Academy of Music, on the Post-Graduate Music Theatre course, and now directs regular Vocal Workout weekends for their Open Academy programme, which offers aspiring singers the opportunity to explore their potential through an intensive programme of practical workshops and masterclasses. 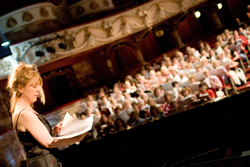 As the Vocal Talent Consultant at Glyndebourne, Mary works with the education team to develop young talent both through their youth opera groups and with the new initiative the Glyndebourne Academy, which aims to assist exceptional aspiring professional singers who have faced barriers to developing their potential. Click here to find out more about the 2017 Academy. She also works closely with Welsh National Opera's education team, acting as vocal specialist and workshop facilitator for WNO Youth Opera tour workshops which take place across Wales and the South West. Mary has also been a regular guest teacher at the Royal Northern College of Music, where she was made an Honorary Fellow in Spring 2011. She was previously head of the singing department at Millennium Performing Arts. Mary is regularly invited to devise and run all manner of workshops and vocal masterclasses for professional and non-professional groups in the UK and abroad. She has run workshops for all levels of student: from non-specialists to post-graduate students and professional singers at all the major opera houses and conservatoires across the UK. Mary is a guest tutor on the Jerwood Opera Writing Programme for Aldeburgh Music, and also runs sessions for professional voice teachers, particularly for those wishing to expand their knowledge of different musical style, for groups including the European Network for Opera and Dance Education (RESEO), the Association of Teachers of Singing (AOTOS), the British Voice Association and the International Congress of Voice Teachers. Subjects range from vocal health and hygiene, career pathways for emerging artists, education work for the developing professional singer to singing contemporary music and vocal improvisation. She has run workshops extensively in Britain and further afield, throughout Europe and in the USA, Australia and Argentina, most recently for the Concertgebouw, Amsterdam. 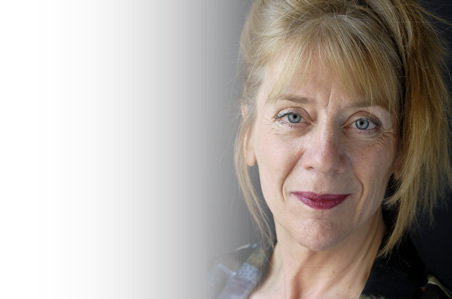 Across the UK, Mary has given numerous masterclasses in both classical and musical theatre styles of music, ranging from work with professional choristers and young singers preparing for early grades, through to aspiring and emerging professional soloists. More recently she has also been giving day-long workshops to non-professional choirs, who are seeking to develop their singing and communication skills. 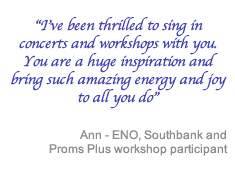 "Mary's a great workshop leader, with a super mixture of teaching, showing and humour"
"I loved her energy and she was so easy with everyone and approachable"
"I really really enjoyed the day, learned a lot and loved the choice of music...."
"It was a brilliant day - such fun. I was exhausted afterwards and could feel muscles I didn't realise I had!" 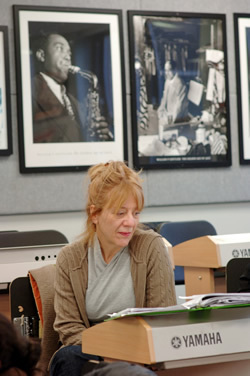 Mary's long association with English National Opera (1989-2006) has incorporated work as a singer, a vocal animateur, and latterly Artistic Associate. For their outreach programme, ENO Baylis, she ran a regular youth group called Live Culture, which developed in 1994 into The Knack, a part-time evening course which aimed to build a bridge into the singing profession for singers from a range of backgrounds. This ran for eleven years until Mary left ENO to set up Voicelab at the Southbank Centre. As Artistic Associate she also devised regular weekend workshops for non-professional singers on core company repertoire called 'Know the Show' attended by hundreds of participants. Mary has recently been teaching at the Western Australian Academy for the Performing Arts in Perth, with the Berlin Philharmonic, workshops on Shostakovich and Orff and an ambitious longer-term project with young performers from Harlem based on The Rite of Spring as part of a residency at Carnegie Hall in New York. Mary's most recent visit included running workshop and vocal skills training for members of the main orchestra. In Zimbabwe, as part of the Bulawayo Music Festival in May 2012 Mary rehearsed and conducted a performance of Carmina Burana with a chorus of 200 and also sang in performances of Richard Sissons' Song of the Carnivores with 500 children from Township schools. To celebrate the Queens Diamond Jubilee Mary coached and conducted (together with Orlando Gough) a choir of 90 as part of the Thames Diamond Jubilee River Pageant. The choir, whose members were drawn from across the commonwealth, sang quirky new arrangements of folk songs from the British Isles. She has also been involved with pioneering music education workshops in prisons. She has had a long association with Pimlico Opera, performing in their acclaimed productions of Sweeney Todd and Guys and Dolls in Wormwood Scrubs and Wandsworth, and in The Threepenny Opera in Downview. With the London Sinfonietta Mary has been involved in several creative projects in both Holloway and Pentonville.